The Coral Gables Public Safety Building is of new world Brutalist design rare among a plethora of old world architecture in a city founded in the early 1920s. It is of cultural and architectural importance for the local community due to it being the only government building in Coral Gables of Brutalist design architecture. The beige brick building has solar glass windows and a four-story lobby framed with large glass panels. The complex includes a police station, a fire station, and a 400-space parking garage. The building was financed by a $5 million dollar bond issue passed by Coral Gables voters in 1971. Construction began in 1973. The building was designed by the Coral Gables architectural firm of Klements and Associates and constructed by general contractor Edward L. Nezelek, Inc. of Fort Lauderdale. 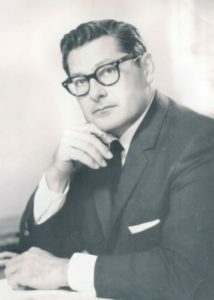 The principal architect was Walter S. Klements who served on the board of directors of the Florida Association of the American Institute of Architects in the late 1960s. Klements was not the first architect chosen to build the now iconic building. Klements “captured the job” when original architect Curt Haley died suddenly. The building was inaugurated with much fanfare on July 19, 1975. The city commission originally considered naming the building after the long-time Police Chief William Kimbrough though ultimately rejecting the idea and upholding the city’s long-standing policy of not naming buildings after individuals. The final cost of the facility was within the $5million budget, costing $4,458.000. The site of the building covered 22 different lots and a tear down of one building which was home to the George Milenoff ballet studio. The five-story structure (with one below-ground level) is in the center of the city and boasts aesthetic significance even though the building has been under-appreciated and basically ignored. Consisting of bays for fire trucks, administrative offices for both fire and police personnel, and a parking garage for city-owned and public vehicles, the 45-year-old building is notable for its use of sculpted concrete massed in monumental exterior curved walls–a geographical manifestation of Tropical Brutalism (design term coined by architectural historian Jean-Francois Lejeune). This aesthetic describes the homegrown Miami-style post-WWII period when architecture was unpretentious, strong, bold, rugged, raw and “honest”. The term Brutalism, a movement that flourished from the 1950s to the mid-1970s, originates from the French term béton brut that translates as “raw concrete”. Brutalism went out of favor in the mid-1970s, but is enjoying a revival and resurgence as a favorite in the Instagram age. The buildings are popular for their uniqueness, and, yes, coolness. The Coral Gables Public Safety Building’s 1970s Brutalist design is an important architectural style typical of the era. Although Tropical Brutalism is uncommon in South Florida, it is evident in various government and educational facilities throughout the area. The current Coral Gables government building—the only Brutalist style architecture in the city—is still in active use, despite city plans for a new Police and Fire Station. The plan includes a scheduled demolition of the building by late 2019. Coral Gables was founded during the City Beautiful movement in the 1920s and boasts Mediterranean Revival-style architecture throughout the city. The Brutalist-style building is rare among the Old Spanish-style buildings, mansions, and cottages and stands as an anomaly — all the more reason for protection. The building’s loss would be of significant consequence for historical preservation. The Coral Gables Public Safety Building is a significant and rare example of Tropical Brutalism in the city and deserves attention, retention, protection, and preservation. For preservation is less about “beauty” and more about the totality of the historical significance within the context of place and time. Brutalism’s time has come again and Coral Gables has an opportunity to be at the forefront of history. This article was written by Karelia Martinez Carbonell, Bruce Fitzgerald, Jane Maranos, from the Historic Preservation Association of Coral Gables.